Reframe challenges and develop perspective! We’ve all heard the idea that when one door closes, another opens, but it’s hard to remember this advice when you’re actively facing hardship. This exercise will help you process so-called negative events in your life so you can gain perspective and find unseen benefit. Try this exercise once and if you like it, try it every day for the full week. Write about a recent time in which you experienced a negative event. Write about the positive consequences, not immediately apparent, that resulted from this event. 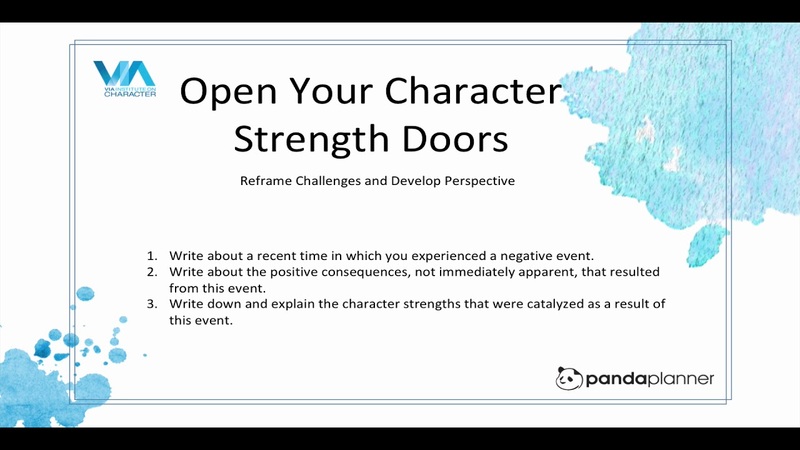 Write down and explain the character strengths that were catalyzed as a result of this event.